Willow trees (genus Salix) are fast-growing trees that thrive in very moist soil. There are over 200 different species of the willow tree worldwide, according to the master gardeners with the South Dakota Department of Agriculture, and around 70 are native to North America. The appearance of these trees can vary widely by species, with some growing very large and others looking more like shrubs. 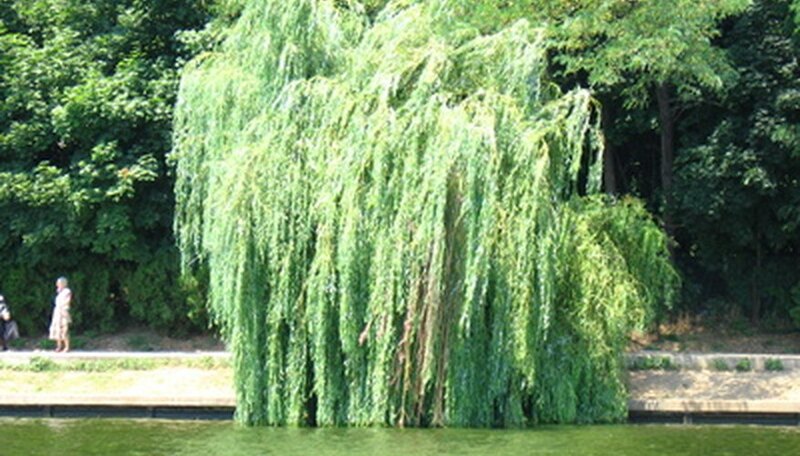 The weeping willow, which is native to Europe, is probably the most famous species of willow. Weeping willows are often seen growing near water, where the soil is moist enough to meet the requirements of the tree and the surface of the water can reflect the beauty of the willow's graceful, dangling branches. The trunk of this fairly short tree (averaging 35 feet tall) is very strong and can easily support the masses of drooping branches. The weeping willow grows best in USDA growing zones 6 through 9. The corkscrew willow has twisted, contorted branches and leaves. The fall foliage on this tree is an outstanding bright golden color, and when the leaves drop off, the twisted branches give the willow an interesting, unusual appearance. For this reason, this short-to-medium sized willow is usually grown as an ornamental tree. The corkscrew willow thrives in USDA growing zones 5 through 8. This species of willow is one of the largest, reaching heights upwards of 80 feet. The white willow gets its common name from the fact that the undersides of the green, slender leaves are silvery-white in color and covered with fine, silky hairs. The branches of this tree, like many willows, are slender. The white willow is hardy to USDA growing zone 2. The black willow is a favorite with many landscapers because of its hardiness in soggy conditions and its striking black bark. Like the weeping willow, it is often found growing along streams, rivers or on the edges of lake beds. The tree grows to heights of 50 feet and usually has several trunks. The black willow, like many willows, has slender leaves that are green on top and lighter green beneath. This tree is hardy in USDA growing zones 3 through 8.